Discussion in 'More News from Your Google TV News Team' started by Rickaren, Nov 6, 2011. Google has been enjoying a rapid increase in customers here, driven by the growing popularity of smartphones and tablet computers powered by its Android mobile operating system. Google appears to be looking to boost its investment in Korea, where it is seeing customers of its Web services increase rapidly thanks to the popularity of smartphones and other mobile Internet devices. 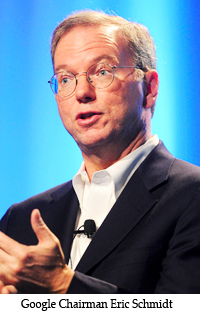 Such expectations greet Google Chairman Eric Schmidt, who will be in Seoul this week on a trip tightly-scheduled with meetings with electronics companies and mobile-phone carriers as the Internet giant looks to expand here. Googles interest in Korea had been casual in previous years as it struggled to compete with Korean search services Naver (ë¤ì´ë² :: ëì ê²½ìë*¥, ë¤ì´ë²) and Daum (Daum -). However, with the Internet moving to mobile devices, the popularity of Googles products has been improving dramatically, as many of the countrys 20 million smartphone users own handsets powered by the companys Android mobile operating system. An industry official told The Korea Times that Schmidt, who will hold a news conference at Googles Korean headquarters, Tuesday, is preparing to make a publicity splash by announcing a number of big investment moves, which may or may not involve a local Internet data center (IDC). A new investment plan will also help Google massage the egos of Internet regulators here, whose attempts to limit online anonymity to curb cyber bullying were dismissed by the search giant. Rumors that Google is interested in acquiring Daum, the countrys second-largest search destination behind Naver, are also not dissipating. Google Korea declined to comment specifically. ``Schmidt isnt coming to Korea just as a diplomatic gesture. Googles investment this time will be large and substantial, said the official. Although Google first established its Korean office in 2004, it didnt make big investments aside from an in-house research center and the acquiring of a few Web technology companies. 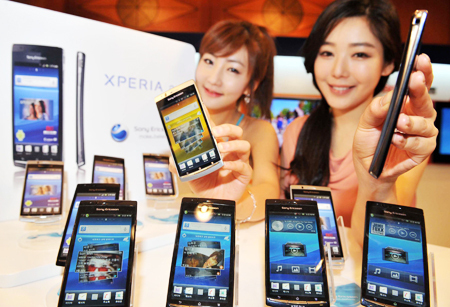 However, the emergence of Android-powered handsets in the consumer smartphone segment has made Google a more important partner to Korean technology companies such as Samsung and LG and mobile-phone carriers SK Telecom, KT and LG Uplus. Choi See-joong, chairman of the Korea Communications Commission (KCC), the countrys converged regulator for broadcasting and telecommunications, had said he will discuss potential investment plans with Schmidt. Schmidt is scheduled to meet Choi on today, before talks with KT Chairman Lee Suk-chae, SK Telecom CEO Ha Sung-min, LG Uplus Vice Chairman Lee Sang-chul, Samsung Electronics CEO Choi Gee-sung and LG Electronics chief executive Koo Bon-joon. ``Issues that relate to the mobile wireless Internet such as payment systems, near-field communication (NFC) technologies and streaming services will be on the table in our meetings with Schmidt, said a high-ranking SK Telecom executive. SK Telecom is aiming to ink a separate business partnership with Google, while its rival KT is also hoping to collaborate further with the company in cloud-computing systems. LG Electronics and LG Uplus are looking at the possibility of using Google technologies to develop better services for mobile-phone-based payments. It remains to be seen whether Samsungs Choi will ask Schmidt for assistance in the companys patent fights against Apple, which happens to be Googles biggest rival in mobile operating systems. Thanks to the popularity of its Android-based handsets, Samsung is now competing neck-to-neck with Apple in smartphone sales. ``The Samsung and Google CEOs will talk on how to maintain and develop their current business partnership, said a Samsung executive. Samsung unveiled prototypes of set-top boxes and blu-ray players to be used with the tentatively named ``Google TV early this year and Google needs Samsungs help to stabilize its TV business. Also, Samsung needs Google to effectively expand its ``smart TV business as content also matters for Internet-enabled TVs.